The zombies are covering the surface of the earth, and only the line chef at this truck shop can stop them. Stop the roaming undead with freeze guns, one-of-a-kind grenade launchers, or spinning shotguns to blow away the walking dead. 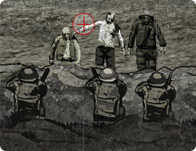 Punch those zombies in their decayed brains and merge their undead flesh into the dirt! Use your mouse to aim and click to fire. Use WASD keys to move. Move through the top-down world as you grab guns, shoot threw boxes and take down enemies. Defend you base from the attackers. Take the role of three (one hidden) famous demon hunters to fight corpses, mummies and witches and to become the Halloween candy king!